July 15th-July 21st Weekly Giveaway WINNER! July 8th-July 14th Weekly Giveaway WINNER! July 1st-July 7th Weekly Giveaway WINNER!! The GroVia All-In-One Diaper has an ultra soft organic cotton inner and a soft layer of water resistant TPU outer. The stretchy tabs give it a perfect trim fit. The GroVia All-In-One Diaper is one size so it grows with your baby. 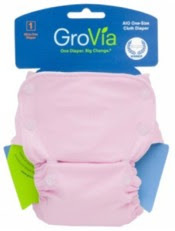 The GroVia All-In-One Diaper fits babies 10-35+ pounds. No more stuffing and no more doublers! To use the GroVia All-In-One Diaper, adjust the rise snaps as needed and just fasten on your baby! Use the snap in soaker for older babies or heavy wetters. No cover is needed. This design makes the GroVia All-In-One Diaper quick drying. 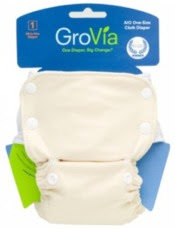 To enter to win a GroVia One-Size All-In-One Cloth Diaper in Vanilla , leave a comment on our blog with a link to each entry (examples: your blog post, your comment on our FB page, etc.). You may only do each entry option once per weekly giveaway. Winner will be posted 8/5. Winner must email annie@nickisdiapers.com within one week to claim your prize. Place an order at nickisdiapers.com or shop at the Nicki's Diapers Retail store between 7/29 and 8/4. Include your order number in your entry. Congratulations to MrsEyeCanSee! You have one two Fuzzi Bunz Perfect Size Cloth Diapers (size small, baby blue and baby pink). Please email annie@nickisdiapers.com within one week to claim your prize! The well-known cloth diaper brand, GroBaby, has recently re-branded and expanded their cloth diaper line to include "A diaper for every family, a healthy way for every little one." Whether you're looking for a healthier disposable diaper option, a hybrid diaper with the option of cloth or disposable, or you're going to use strictly cloth diaper, GroVia has something for you! GroVia was generous enough to sponsor this review! After nearly 3 years of cloth diapering, I've tried just about every diaper out there. 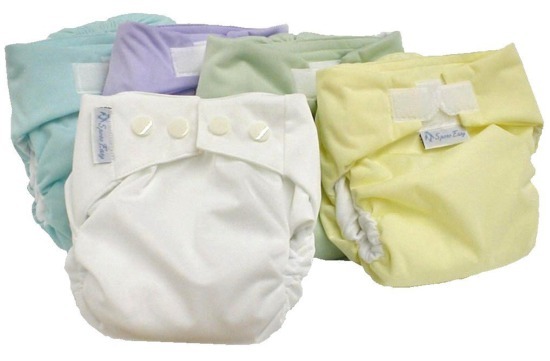 I have a large variety of diapers in my stash, from prefolds, to fitteds, to pockets, to all-in-ones, to all-in-twos. I find that I prefer certain diapers for certain occasions. If you are looking for a diaper that will work for EVERY occasion, the GroVia All-In-One is the perfect diaper for you. The GroVia All-In-One is a one-size cloth diaper, so there is no need to size up as baby grows. Unlike many one-size diapers, this diaper is TRIM! The side snap closure is on stretchy panels, which hugs your baby, giving a custom fit without leaving red marks. The organic cotton inner is super absorbent and butter soft. There is no need to stuff any pockets with an all-in-one and the soaker pad is attached at one end to ensure quick drying. The GroVia All-In-One diaper is very attractive looking with a streamlined front that has matching snaps and side panels. It is currently available in three colors; Vanilla, Cosmos and Ice. I used this diaper on my 1 year old son (22 pounds) and my 2 1/2 year old son (33 pounds) and had a great fit on both of them. My younger son still had one snap left in the rise setting and my older son had the diaper fully open, but plenty of room for growth. This diaper also made a great training pant for my older son. With the stretchy side panels snapped one snap looser than you would when using it as a regular diaper, it's easy for him to pull up and down. Check back on Thursday for your chance to win a GroVia All-In-One Cloth Diaper! FuzziBunz® Perfect Size Pocket Diapers have stretch elastic around the legs to better hug baby's curves, noticeable large tabs for a better grip and to prevent sagging, and top stitching for added reinforcement of seams. FuzziBunz® Perfect Size Pocket Diapers comes with a FREE insert! The FuzziBunz® Perfect Size Pocket Diapers is one of the workhorses of reuseable cloth diapering systems. They are made with the most innovative and finest materials. Available in many colors they are also stylish yet work hard to keep your baby's bottoms rash free and dry. 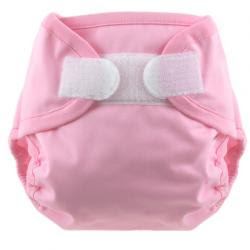 FuzziBunz® has recently added the FuzziBunz® One Size Diaper to their line. When choosing the right cloth diaper for your baby, you will need to decide if you want a "one size" diaper or a "sized" diaper. The FuzziBunz® One Size Diaper will fit your baby from birth to potty training without the added expense of buying another size. The FuzziBunz® Perfect Size Pocket Diaper gives you a diaper that is trim fitting and snug without the added bulk a "one size" diaper may have. If a really great fit and "stuff and go" convenience is important to you, then the FuzziBunz® Perfect Size Pocket Diaper is for you. 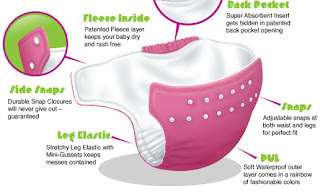 FuzziBunz® are made from soft leakproof outer material to keep the wetness in and 100% breathable poly fleece inner layer with a pocket in between the two layers for a specially designed insert (one comes free with each diaper). 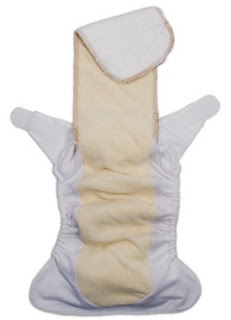 The super soft custom milled fleece pulls mositure away from baby's skin into the insert keeping your baby feeling dry, comfortable, and rash free! With the pocket style opening you can adjust your baby's absorbency to fit any needs - stuff the diaper with an insert, prefold, or even a hand towel! The updated top-stitiching circles the top of the diaper and tabs, providing reinforcement and demonstrating the high quality of these diapers that hold up wash after wash. The new larger, square tabs hold the diaper in place to help prevent sagging and to provice a better grip during diaper changes. The leg casings create mini-gussets to keep messes in and guard against leaks. 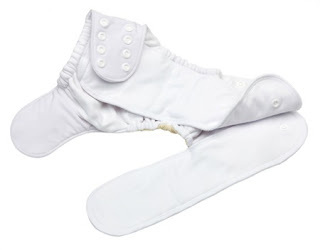 The stretchier elastic around the legs provide your baby with the great comfort and no red marks. 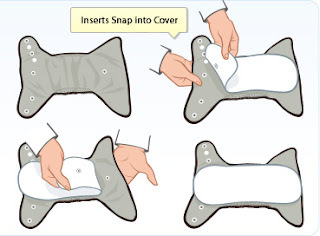 The adjustable snap settings grow with your baby and enable you to adjust for baby's leg and waist sizes. So many benefits! To enter to win two Fuzzi Bunz Perfect Size Diapers in size small (baby blue and baby pink) , leave a comment on our blog with a link to each entry (examples: your blog post, your comment on our FB page, etc.). You may only do each entry option once per weekly giveaway. Winner will be posted 7/22. Winner must email annie@nickisdiapers.com within one week to claim your prize. Place an order at nickisdiapers.com or shop at the Nicki's Diapers Retail store between 7/15 and 7/22. Include your order number in your entry. Congratulations to Christal! You are the winner of an EasyFit One Size All-In-One Diaper by TotBots! Please email annie@nickisdiapers.com within one week to claim your prize! This week we're featuring a few great products for Item of the Week! Swaddlebees ABC Wraps $15.95 SALE $13.95 Swaddlebees Fleece Wraps $14.95 SALE $11.95 Swaddlbees Merino Wool Wraps $27.95 SALE $19.95 All Mommy's Touch Products 10-15% OFF Item of the Week runs Wednesday through the following Wednesday. Wednesday is DOUBLE DEAL DAY with overlapping Items of the Week! EasyFit One Size All In One Diaper by TotsBots features an easier than a pocket system. The super thirsty liner is attached to the diaper which makes it fast drying and easy to clean. The attached liner can be folded to create up to 6 layers of absorption! The liner has 2 layers. Ultra soft rayon made from bamboo fibers is against baby's skin and actually absorbs 70% more quickly than cotton so there is no run-off leaking out the side of the diaper. The other layer is an ultra absorbent layer of 100% polyester micro fiber that doubles the absorbance. Plus you can adjust the absorption you need for heavy wetters and nighttime through the pocket at the back. Protective side guards of anti-wicking, soft brushed polyester prevent compression wetness. EasyFit One Size All In One Diaper adjusts with snaps to fit babies 8-35 pounds. It is slim fitting with multidirectional stretch. The Hook & Loop fasteners are generously sized for ease of use and the fold-back laundry tabs really stick! 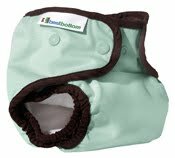 The attached liner can be folded to create up to 6 layers of absortion where your baby needs it. You can even add extra liners for heavy wetters and nighttime. The liner has 2 layers. The ultra soft rayon made from bamboo fibers against baby's skin actually absorbs 70% more quickly than cotton so there is no run-off leaking out the side of the diaper. The layer of 100% polyester microfiber double the absorbance. EasyFit's protective side guards of anti-wicking, soft brushed polyester prevent compression wetness. This diaper is made to contain all leaks! EasyFit One Size All In One Diaper by TotsBots is made in Glasgow, Scotland from environmentally friendly fabrics. TotsBots is a great company that is dynamic and ethically minded. To enter to win an EasyFit One Size All In One Diaper by TotsBots, leave a comment on our blog with a link to each entry (examples: your blog post, your comment on our FB page, etc.). You may only do each entry option once per weekly giveaway. Winner will be posted 7/15. Winner must email annie@nickisdiapers.com within one week to claim your prize. The winner of this week's giveaway is The Carrolls (of Kalamazoo, MI)!!! Congratulations! You've won a Best Bottom Cloth Diaper One-Size Shell in your choice of color and closure AND 3 Stay-Dry Inserts in your choice of size! Please email annie@nickisdiapers.com within one week to claim your prize! Swaddlebees ABC Wraps 10% OFF!!! FREE SHIPPING!!! Item of the Week runs Wednesday through the following Wednesday. Wednesday is DOUBLE DEAL DAY!! I've been using the TotsBots EasyFit All In One for about a month now. I wasn't all that impressed at first look - well, other than the gorgeous colors it comes in - but was intrigued enough to give it a try. I have to say that I am REALLY glad I did! One of my hesitations was that my toddler is already 35 pounds so I wasn't even sure that it would fit. Well, not only does it fit, he's got room to grow in it. Also, I'm a fan of natural fibers next to skin and the bamboo inner on this one is really innovative. Normally with a natural inner I would expect wicking but the TotsBots has a bamboo strip down the middle and then the stay dry material on the edges. Because of this design, I've had no leaking or wicking even when my toddler goes 3 hours between changes during the day. 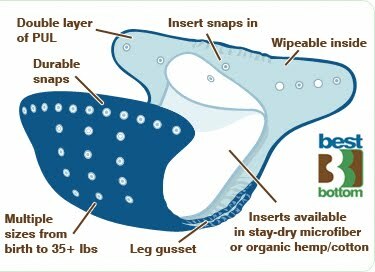 We've used it at night laying in a hemp doubler and our mornings have been nothing but dry. I did use this diaper after just washing it twice and it did leak then. Since it does have bamboo it does need extra prepping - 6-8 washes and even though I knew better I just couldn't wait to try it. Did I mention how trim this diaper is? Jeans are not a problem with this diaper. Trim, trim, trim! Now let me talk about the velcro. I love the laundry tabs on this diaper - they fold right over to the inside so when you go to put the diaper on they are easily accessible. By that I mean there is no fishing out the tabs from under baby - it actually reminds me of a disposable in this regard - super easy. Oh, and the laundry tabs have stuck through every washing I've done. The outer material is not quite as soft as other PUL I've used but it doesn't pill at all and is still as bright as ever. I'm always torn over whether I should use this diaper first thing out of the wash or save it for the diaper bag because of how easy and dependable it is. It does require that you stuff the insert back in when its out of the wash but since its all attached its easy enough and since it agitates out in the wash I'm a happy camper! I am really happy with this diaper and can honestly recommend it to anyone looking for a new all in one to try! The TotsBots EasyFit One-Size All-In-One Cloth Diaper was reviewed by Sarah, Senior Sales Associate at Nicki's Diapers and Mom of 3 beautiful children.Her youngest son, age 2 1/2 and 35 pounds tested this diaper :) Check back on Thursday for your chance to win a TotsBots EasyFit One-Size All-In-One Cloth Diaper, sponsored by the manufacterer! 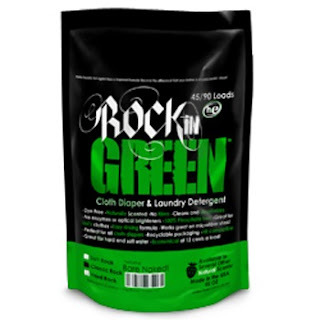 We were only able to get in contact with one of the winners of our Rockin' Green Giveaway so we drew another one. Congrats to Stacy (commented 6/23 at 3:47pm) for becoming our second winner of that giveaway! 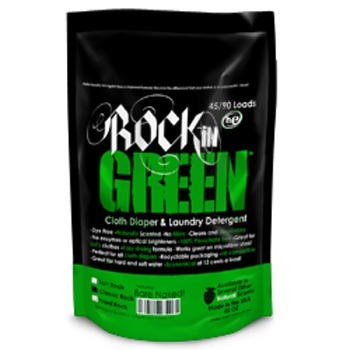 You've won a 45/90 load bag of Rockin' Green Cloth Diaper and Laundry Detergent in your choice of formula and scent! Please email annie@nickisdiapers.com within one week to claim your prize! 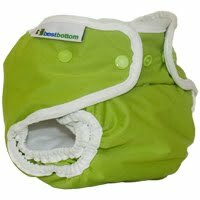 To enter to win aBest Bottom Cloth Diaper Shell in your choice of color and closure and 3 stay-dry inserts in your choice of size, leave a comment on our blog with a link to each entry (examples: your blog post, your comment on our FB page, etc.). You may only do each entry option once per weekly giveaway. Winner will be posted 7/8. Winner must email annie@nickisdiapers.com within one week to claim your prize. Tell us one area you'd like to improve on when it comes to being more green or frugal. Tell us one thing you do (besides cloth diapering) to be more green or frugal.